Loryn Nalic of Balkan Treat Box. "I wasn't the best student, so when I got my report card, I would play restaurant for my parents," Nalic recalls. "I'd turn the whole house into a restaurant — cook dinner, put out flowers, dim the lights, everything. Food was always something I used to get myself out of situations." For Nalic, though, food wasn't just a way to get out of things. It was a way to get into them, too. The daughter of a busy working mother, Nalic would spend time with her mom in the kitchen, learning how to cook as they watched the Saturday morning PBS shows together. "She was a fantastic cook, and this was my way to be close to her," Nalic explains. "Anytime she was in the kitchen, I was right there with her." In addition to being a great home cook, Nalic's mother worked in restaurants. Naturally, her daughter picked up the love of the business, so when it came time for her first job, Nalic was hired on as a busser at the old Lemmons. A subsequent job at Yemanja Brazil gave her her first cooking break. "Yemanja was my first real taste of the professional kitchen. They really showed me around and taught me so much," says Nalic. "However, that's also where my first learned about the foods of different cultures. The chef was a joyous man who taught me about all of these foods that were different than what I grew up with." Though Nalic thrived in the kitchen, she took some time off from the business to raise her kids. When she was ready to go back to work, she found herself back on the line, this time doing pastries at Turvey's on the Green. That led to gigs with a few bakeries around town, as well as stints with Frazer's and the Del Pietro restaurant group. In search of a more family-friendly schedule, Nalic took a 9 to 5 food sales job — an opportunity that ironically set the course for her to return to the kitchen even as she'd been trying to get out of it. 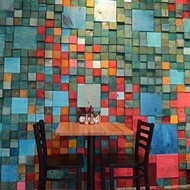 While calling on one of her accounts, she met Edo Nalic, the manager of south city's Taft Street Restaurant and Bar. "It was love at first sight," Nalic recalls. "Both of us say it was like a bolt of electric." Edo, a native of Bosnia, took Nalic to all of his haunts in the Bevo neighborhood and introduced her to Balkan food, a cuisine she fell in love just as quickly as she had with her husband. Nalic instantly knew that if she was going to open a restaurant, it would be this style of food. She learned as much as she could from Nalic's family, even going over to Bosnia and working in restaurants and home kitchens to soak up as much information as she could. 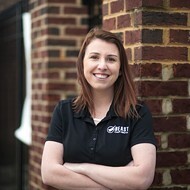 Before she branching out on her own, however, Nalic took a job with the Pappy's Smokehouse as its catering and events manager a job that introduced her to some of the city's top chefs. 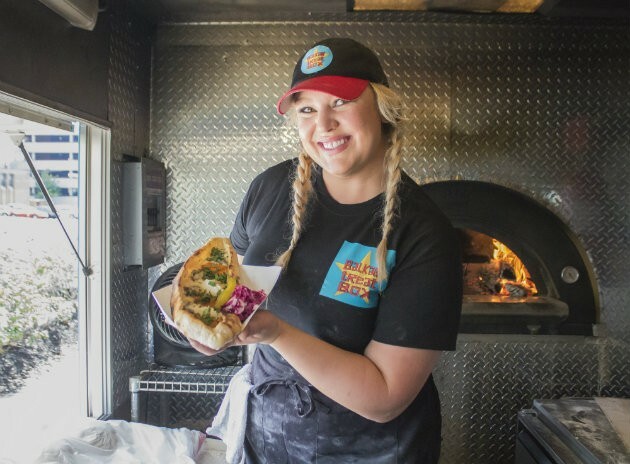 As her idea for what would become the food truck Balkan Treat Box took shape, she sought training from the likes of Josh Galliano, Kevin Willmann and Qui Tran, who augmented her self-taught skills. In December 2016 she opened Balkan Treat Box as a roving purveyor of her beloved cuisine. Though she's not a native, Nalic insists that her food is every bit as authentic as if she'd been doing it her entire life. "I've watched Edo's family, and it's beautiful to see the way everything comes together," Nalic says. "The things they do have been passed down from generation to generation and they were starting to die out. That's why it was important for us to learn everything so we could preserve it." 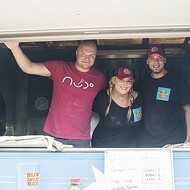 Nalic hopes to have a brick-and-mortar one day, but in the meantime, she's busy on the truck, stoking the wood-fired oven and making every last item from scratch. She took a break from the business to share her thoughts on the St. Louis culinary scene, how cooking is a lot like dancing and why two chefs are better than one. Between running the truck right now and our family life, it's easy to get preoccupied. I make sure to check in with my husband, daughter and son to keep ourselves grounded. I am working towards having those daily rituals again. I need them to feel balanced. I'd like to see more food stalls or a place for them around St. Louis where there is prominent foot traffic. Oh man, I'm going to take this in a different direction. I have three solid duo crushes in St. Louis. I want to be a little like all of them. One duo in particular that I hope makes a comeback someday is Josh Squared: Galliano and Poletti. Theirs is still some of the best food I can remember here. Josh Galliano has mentored some of the best chefs in St. Louis. He lives and breathes his work and is extremely helpful. I respect that. Another pair is Qui Tran and Marie-Anne Velasco. Not only are they extremely knowledgeable and savvy, they remind me that we can be professional and still have fun. These two are seriously local celebrities to me. There is also nothing Marie-Anne doesn't know, culinary-wise, and there is nothing Qui won't do to help someone out. Finally, there's Ermina and Senada Grbic. Wow. These women. They are the hardest working ladies in the business. They have grown a little local empire, and their talent and ability to make everyone feel like family is admirable. Some of my favorite foods come out of their kitchens. And you always listen to everything Mama Grbic says — well I do! It’s another team for me, because one person can't do it alone — Kevin Willmann's line over at Farmhaus: Jake Sciales, Michael Frank, and Traviss Smelser. It's simple, yet creative, food done the right way that tastes damn good. The four of them make up a dream team. Farmhaus is on fire! I’m a big personality, so I will say cilantro. You either can't get enough — or I taste like soap.